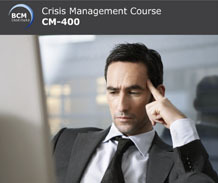 This 2-Day course is a unique competency-based Crisis Communication course designed uniquely for participants who are business continuity managers/implementers that have no crisis communication background. The emphasis is to assist his/her crisis communication counterparts as part of their role as an emergency and incident management, crisis management and business continuity management team member. Completion of the 2-Day competency-based crisis communication course also allows participants to achieve an internationally recognised Crisis Communication certification, i.e. 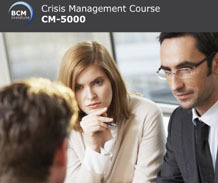 the Crisis Communication Certified Planner (CCCP)* certificate. The Crisis Communication Certified Planner (CCCP) certification is awarded to participants who successfully completed the 2-Day CC-350 Implementing Crisis Communication Plan course and pass the Qualifying CCCP examination. To train participants who do not have a crisis communication background and are in the emergency and incident management, crisis management and business continuity management team, to have the competency to establish crisis management plan for their organisation. Newly appointed members of the BCM/CM/ Incident and Emergency Management team. There is no examination attached to the course, but a WSQ Competency Assessment needs to be attempted and passed for Singaporean and Singapore PR to obtain his/her WSQ Statement of Attainment (SOA). Examinations are only applicable if participants opt to attempt the Qualifying CCCP examination at SGD150. The CCCP Examinations is 1.5 hours, 50 online Multiple Choice Questions done in an invigilated room either at BCM Institute’s designated exam venue. All course fees include courseware and two tea breaks. SGD 150 for the Qualifying CCCP examination fee.